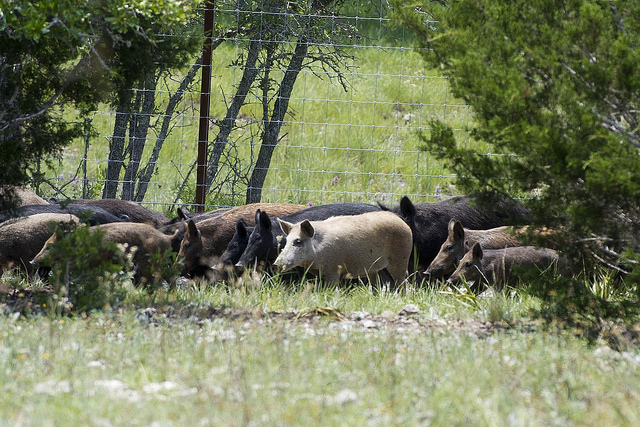 Feral hogs account for more than $52 million dollars in damage to Texas agriculture annually. The cost to habitat and wildlife is incalculable. While Texas has more feral swine than any other state, we don’t know their numbers. Estimates at the statewide scale are pretty loose. And I’d kind of like to leave it at that. Justin Foster is research coordinator at TPWD for region two. He said some estimates suggest upwards of 3.5-million feral pigs roam Texas. Their impacts are certainly well documented and widespread. And, I think all of them [impacts] are not identified yet. They may, in fact, be doing more harm than we know. These animals are adaptable, robust, and are reproductive stars. Populations vary due to wide-ranging resource conditions. Hunting is not effective when it comes to reducing their numbers. So, Texas Parks and Wildlife is studying the use of a toxicant to control them. We’re talking about, literally, a pesticide. It is an active ingredient that is targeted to produce a lethal outcome for the purposes of control. In this case, that active ingredient that our work centers around is sodium nitrite. Tomorrow: the trial and error process of finding an effective control. This entry was posted on Wednesday, August 15th, 2018 at 12:00 am	and is filed under feral swine, Research, Texas Invasives, Wildlife, Wildlife and Sport Fish Restoration Program. You can follow any responses to this entry through the RSS 2.0 feed. You can skip to the end and leave a response. Pinging is currently not allowed.